"We" are Alexander Gregori and Lauretta Ngakane, the authors of this book. We are Mobile Marketing Winner$ team leaders and internationally published authors and -speakers on mobile marketing and we personally guarantee that we will refund the US$ 9.99 that you will pay for this book within 60 days if you are not 100% satisfied that our book is worth what you paid for it. The book will help you fully understand mobile marketing from A - Z and teach you how to create your own successful, dynamic mobile marketing campaign. Simply put, it will help you turn the cell phones of your customers into SELL phones for your products and services! 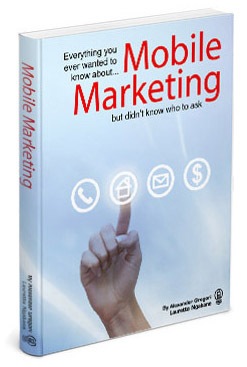 So, if you are a novice wanting to get into mobile marketing without burning money by “trial and error”, are already in mobile marketing and want to learn how to increase your ROI, or you are simply interested in the “How” and not the “Wow” of mobile marketing, then this book is for you. And a DETAILED GLOSSARY of mobile marketing terms! * System requiremens are simply Adobe Acrobat Reader for either PC or MAC. LIMITED SPECIAL ONLY US$ 9.99!